In northern Italy, ragùs tend to be less about tomatoes and more about the meat and aromatic herbs that flavor them. Venetian ragù, for example, is made from the meat of the wild ducks and is perfumed with native bay leaf and fresh sage. Some versions of this ragù use duck stock and the liver and giblets, while others (like the recipe below) get deep flavor from duck legs and thighs and dry red wine. 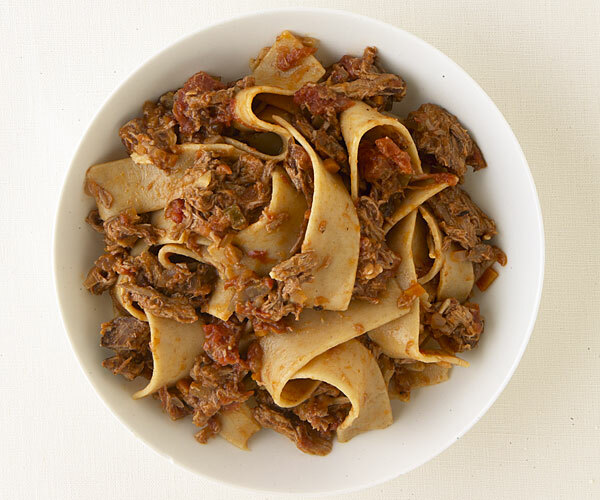 Venetian duck ragù is typically served with fat, tubular buckwheat noodles called bigoli, but it’s also delicious with whole-wheat fettuccine, spaghetti, or pappardelle, as shown here. Heat the oil in a 5- to 6-quart Dutch oven or other heavy-duty pot over medium-high heat. Season both sides of the duck legs and thighs with salt and pepper and arrange them in the pot, skin side down. Sear until the skin is browned and crisp, about 7 minutes. Using tongs, turn the legs over and brown the other sides, 2 to 3 minutes. Transfer the duck to a deep platter. Pour off all but about 1 Tbs. of the rendered fat and discard or save for another use. Reduce the heat to medium low. Put the celery, garlic, onion, carrot, sage, and bay leaf in the pot. Cook, stirring frequently, until the vegetables are softened, 7 to 8 minutes. Pour in the wine and increase the heat to high. 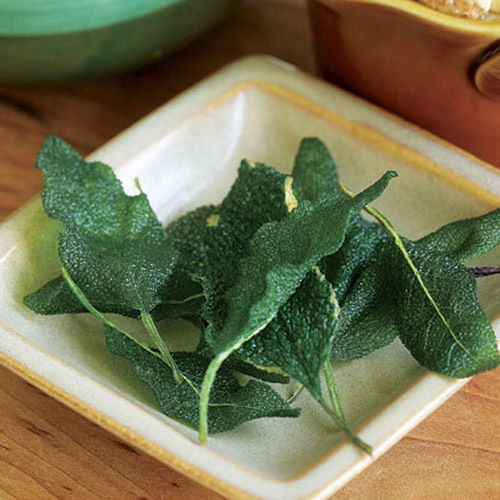 Cook at a lively simmer for 1 minute and then reduce the heat to medium. Stir in the tomatoes with their juice and 1/2 cup of the broth. Return the duck to the pot and bring the liquid to a boil. Reduce the heat to medium low or low to maintain a gentle simmer. Cover the pot and simmer until the meat is fork-tender, 1-1/2 to 2 hours. 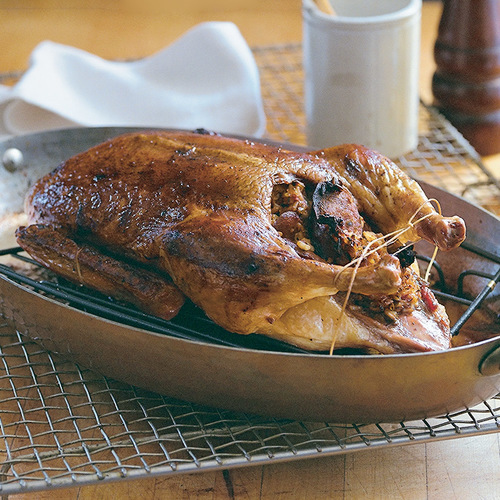 Remove the duck from the pot and set aside until cool enough to handle. Meanwhile, skim the excess fat from the top of the sauce with a large spoon. If the sauce seems thin, continue simmering until flavorful and thickened to a saucy consistency. Discard the duck skin and shred the meat. Add the shredded meat to the sauce, along with the other 1/2 cup of broth if the sauce seems too thick. Let the sauce simmer gently for 15 minutes; discard the garlic and bay leaf. Season to taste with salt and pepper. When ready to serve, bring a large pot of well-salted water to a boil over high heat. Cook the pasta until al dente—you want it to still have some bite because it will continue to cook a bit while you’re tossing it with the ragù. Reserve about 1 cup of the cooking water and then drain the pasta. Return the pasta to the pot and toss it with some of the ragù, adding a little cooking water if it seems dry. 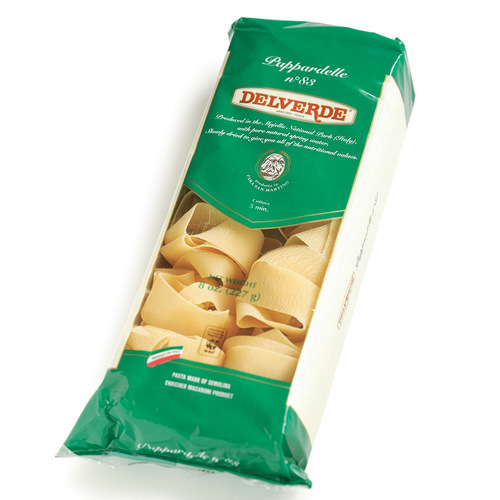 Serve the pasta with more ragù spooned over the top, garnished with freshly grated Parmigiano-Reggiano, if you like. The ragù can be refrigerated in an airtight container for up to 3 days or frozen for up to 3 months. Reheat gently before tossing with pasta. Wonderful recipe with lots of great flavors! At the end, since my family doesn't like chunks of tomatoes in the sauce, I used an immersion blender just before adding the duck back in--think it made a great improvement! My son made this pasta for us (he's 22 and not a chef). We followed the recipe with a few exceptions. First, we had an abundance of wild duck breasts which we substituted for the legs and thighs. We first let them soak overnight in 2% milk (I think any kind of milk would be sufficient...just what we had on hand). The next morning, we made a simple brine of kosher salt and sugar,...about a quart of water and 1/4 cup salt and 1/8 cup sugar. We then washed the duck and then put them in the brine for the entire day. He prepared the recipe as written. My son used diced tomatoes and I think for me, I would use crushed in the future. No matter. This was one of the best Italian recipes we've ever made. Splendid and easily in the top 5 of our keeper Italian recipes. The next day, I brought the sauce to work and shared with 8 coworkers. 5 wanted the recipe!